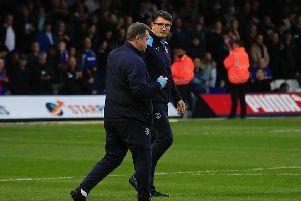 Luton chief executive Gary Sweet won’t be rushing in his bid to find a new permanent manager after the club have continued to flourish under interim boss Mick Harford. Since the Hatters legend took over from Nathan Jones, who left for Stoke City earlier this month, Town’s league form has been nothing short of remarkable, with the 3-2 win over Portsmouth on Tuesday night a third straight triumph. They also drew 1-1 at Sunderland and are now five points clear at the top of the table, six ahead of third-placed Barnsley. Speaking to Talksport about the ongoing search, Sweet said: “When clubs lose a manager it’s always seems like a bit of rush job to replace them, a bit of panic move. “We can’t panic here, we’re doing so well and the squad of players don’t really need that much day to day management, they do it. “So we’re quite happy to go with the momentum and maybe next week after the (transfer) window is closed, Mick and us will sit down because Mick is also helping us recruit the manager. Sweet did also once again reiterate his feelings against moving for another club’s manager while the transfer window remains open. He continued: “The thing with Nathan leaving when he did, was just the timing of it. “We knew he would perhaps go on at some point, but in the January transfer window, that’s not really down to him, but as much Stoke. Sweet was also thrilled with how the level of performances achieved by Town’s players have reached new levels under Harford’s stewardship. He added: “Mick, and Steve Rutter (assistant) and Ini (Idiakez) who stepped up to first team coach, they’re doing a splendid job. “The players love their involvement and arguably we’ve played the best football in, not just last season or three years, but 10 years, since Nathan left and that’s no disrespect to Nathan. "The players are galvanised, they’ve got a bit of siege mentality about it, they’re digging the heels in and they manage themselves. "They’re a great, great bunch of characters our squad, they’ve got a lot of leaders in there, a lot of captains. So they’re looking after themselves and that’s not taking anything away from Mick, but they’re a great bunch of lads and Mick will say the same thing himself.